Update september 27th, 09 Evan sent us some new pics to look at scroll to the bottom and look for the newest date. Update May 11th, 09 Evan found a cool old motomower,scroll to the bottom to check it out!. Update april 2nd, 09 Scroll to the bottom to see evan's new ride a old round hood case awesome find evan!! 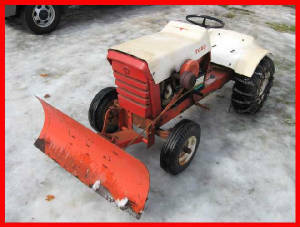 Check out evan's rare 1966 toro,you won't find many of these around,also got a nice bolens husky and the motomower you know is a favorite of mine.Evan's email is below. I finally gathered some pictures up if you would like to put them up on your site. 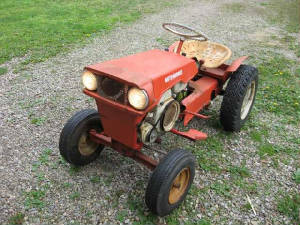 The first two pictures are of my 1966 Toro 55300. This was built the same year that Toro bought Springfield, and this tractor is nearly identical to the Springfield 66TE-10. 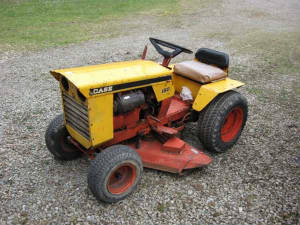 I found this tractor on Craigslist, and just could not pass it up. 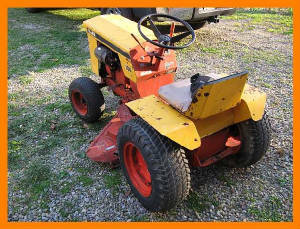 It has an excellent running 10 hp Kohler K-241 with a 4-speed transaxle. In addition to the blade, I also have a 42" deck, which is in good shape. The hood and fenders are fiberglass, while the grill is made of cast iron. Secondly, there is my Bolens 1254. 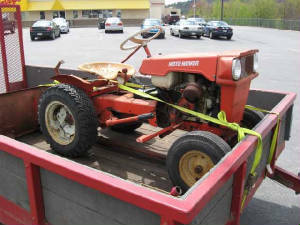 My great aunt bought this tractor new in October 1972 for $1350, and that price included the deck and the blade, as well as the hydraulic lift. I just recently purchased the snow thrower off of Craigslist. 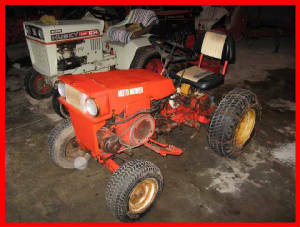 It has the original 12 hp Wisconsin TRA12-D, which has been rebuilt once and runs very good. 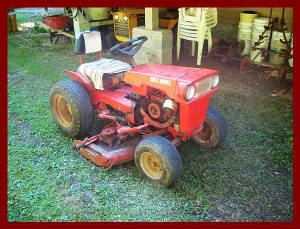 Although its starting to show its age, cosmetically it still looks above average and it still does a nice job mowing. It is definitely one tough tractor. 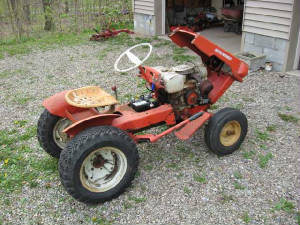 Lastly is my 1967 Moto-Mower 6025-100. 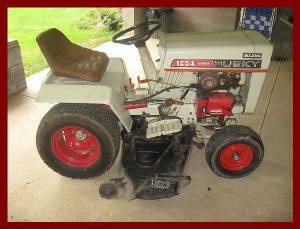 My neighbor gave me this tractor back in 1995 or 1996 as he no longer needed or wanted it. At the time, reverse gear was out of it so I tore the transaxle apart and then lost interest for about 12 years. It wasn't until last fall when I found a parts tractor on ebay that I regained interest in this project. I plan on using the entire transaxle out of the parts tractor to get this thing back up to speed. Like my Toro, it also has the Kohler K-241. I had the engine started in December '08 and it sure sounded good after sitting for many years. I currently have put this project on hold until the weather warms up, but I hope to have it ready by summer. 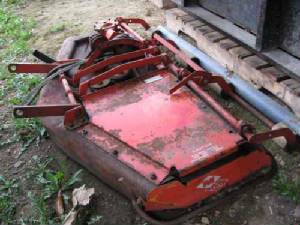 I also have a 42" blade and 42" deck for this tractor as well, both of which are in good shape. Evan's new ride a cool old case. Here ya go! I've just attached one picture for now until I get some better ones. Anyways, this is my 1966 Case 150 that I just picked up off of Craigslist. 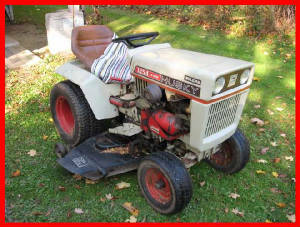 It too, like my Toro and Moto-Mower, has a 10 hp Kohler K-241. This tractor runs great and overall is in very straight condition. The only real problem with it is the hydraulic brake unit leaks, which makes it inoperable on hills. It has a 38" deck, which is in decent shape, and I also have the headlamps for it. Mat 11th, 09 Check out evan's cool old motomower.It sure seems a lot of guys are finding these old motomowers anymore I love it!!!. 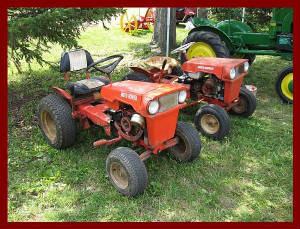 Here are the pics of my new Moto-Mower for motomow.com. This one is a 1966 model 6024-100. It has a good running 8 horse Kohler K-181 on it. 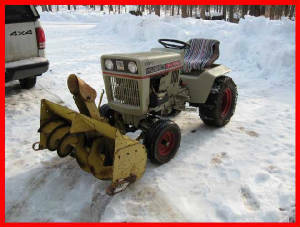 The tractor overall is in nice original shape and came complete with the original mower deck and snowplow. Definitly a newer style deck than i'm used to seeing on the motomowers, I like the rounded look better and really like the rollers along the back to.Remember to click on the pics for a better view. Update september 27th, 09 evan sent us some new pics to look at. Was looking at my page at motomow.com and realized its been awhile since I've sent any updated pics. 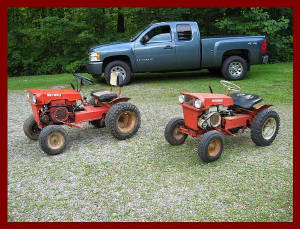 I since have sold the Toro, but still have the other 4 garden tractors. Here's a few pics of them you can upload whenever you get around to it. I love these things evan's old case.